Maintaining spreadsheets, composing business documents, or even building slide-style presentations are a mainstay of modern business, including small and mid-sized online retail operations that often depend on the Microsoft Office suite to compete these tasks. The dependency on Office has also prevented some businesses from considering alternatives to the popular Microsoft Windows operating system or Apple’s Mac OS X, both of which are proprietary, relatively bulky — in terms of memory and storage requirements — and potentially more expensive than Ubuntu Linux, an emerging, open-source, and often free operating system that may be more suitable for some small businesses. Linux is an operating system. It will be the first thing a user sees when a computer — running on Linux — is turned on. Linux will (a) provide the login screen, (b) manage file storage, and (c) provide the platform on which other software — like spreadsheet or word processing solutions — run. An engineer named Linus Torvalds released the Linux kernel — the most basic part of the operating system, if you will — in October 1991. Since then, Linux has grown to become the most popular operating system on web servers, running more than 90 percent of them. It also manages more than 60 percent of all servers of any kind for any use, and Linux underlies the majority of mobile smartphones, since Google Android is based on Linux. For desktop computing, Linux has trailed in popularity for two reasons. First, many consumers, if they knew about Linux at all, believed that Linux was for more tech-savvy folks. Second, Linux could not run some software designed for Windows or Mac OS X, like Microsoft Office. Ubuntu Linux is a Linux-based operating system that is every bit as easy to operate as Windows or Mac OS X. It includes all of Linux’s benefits, and can either run Office via a program called WINE or use any number of free or paid alternatives to Microsoft Office that work natively on Ubuntu. If someone knows about Ubuntu and has been putting off trying the operating system, here is good news: There are actually many excellent Office suite alternatives. LibreOffice is pre-installed on current versions of Ubuntu — version 12.04 was the most recent at the time of writing — and it “is not some lightweight sour-grapes substitute for Microsoft Office…it is a full-featured contender,” wrote Grant and Bull. LibreOffice has four applications, Writer, Calc, Impress, and Draw. LibreOffice Writer is a word processing suite similar in purpose to Microsoft Office’s Word. It has all of the most common Word features — although these may be accessed in different ways — and some features that Word does not. I wrote this article, as a point of interest, in LibreOffice. LibreOffice includes a full featured word processing and document creation application. 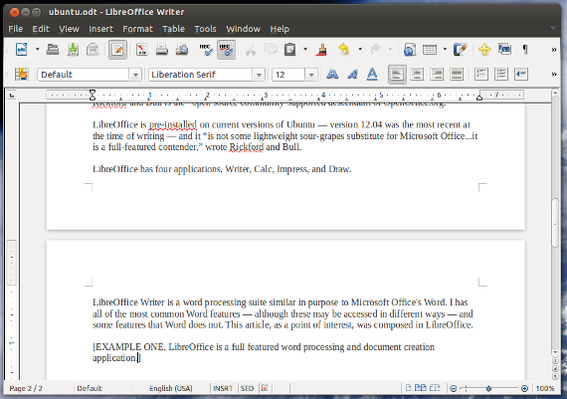 LibreOffice Writer can read and write Microsoft Word files too. 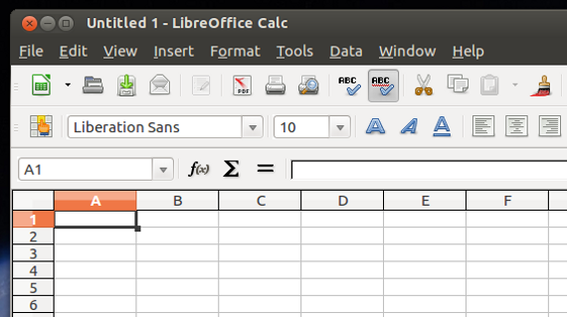 For managing spreadsheets LibreOffice has Calc. Calc can do just about anything that any significant spreadsheet software can, and is a good choice for managing product inventories, projecting sales, or similar. LibreOffice Calc is also compatible with Microsoft Excel in that it can open, read, and write to most versions of Excel files. LibreOffice Calc is a capable spreadsheet solution. For slide-based presentations, LibreOffice includes Impress. Impress allows users to create presentations in a fashion similar to Microsoft PowerPoint. Impress is also generally compatible with PowerPoint, but there can be challenges converting files from PowerPoint presentations created on Apple devices. LibreOffice Impress is an effective presentation solution. LibreOffice also includes a graphics solution called Draw. Draw is by no means a full-fledged graphics or photograph manipulation solution. But for simple graphics it can be very helpful. Ubuntu can also easily run OpenOffice, which, as Grant and Bull noted, is the forerunner to LibreOffice. OpenOffice has its own versions of Writer, Calc, Impress, and Draw that function very much like LibreOffice. To these, OpenOffice adds Base and Math, which are database manipulation solution similar to Microsoft Access and a graphic user interface for working with complicated mathematical equations respectively. Like LibreOffice, OpenOffice is free to use on an Ubuntu-powered computer. A third excellent alternative to Microsoft Office for Ubuntu users is SoftMaker Office 2012 for Linux. SoftMaker costs $79.99 and offers a word processing solution (TextMaker 2010), a spreadsheet solution (PlanMaker 2010), and a presentation solution (Presentations 2010). There are also a number of cloud solutions — including Ubuntu — that, strictly speaking, will work on any operating system that supports an Internet connection and a modern browser. Google Docs and ZoHo are prime examples. Both of these are particularly good for sharing documents and for users who move from one device to another frequently. Grant and Bull also pointed out several other available applications that were not, in the strictest sense, alternatives to Microsoft Word. But the applications are productivity solutions that are available for free for Ubuntu, as follows. Dlume. A standalone address book application. FocusWriter. A “distraction-free” word processing solution. AbiWord. A lightweight word processor. gLabels. A label management and printing solution. FreeMind. An idea charting tool. Scribus. A commercial-grade desktop publishing suite. PDF-Shuffler. A PDF management tool that allows for combining or reorganizing PDF files. Labyrinth Mind-mapping. An idea charting tool. Ubuntu is a good alternative to either Windows or Mac OS X. In the past, some users have not considered Ubuntu or Linux because of an apparent dependence on Microsoft Office. Fortunately, there are now many excellent alternatives to Microsoft Office for the Ubuntu operating system.